Cart2Cart is literally impossible to spot from extending the number of supported carts! 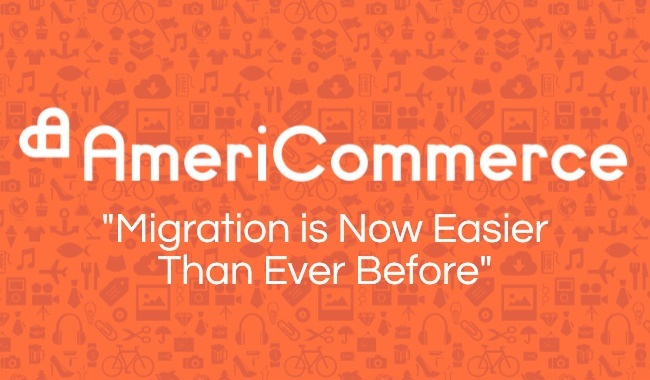 AmeriCommerce has entered the list of platforms available for data migrations. Now, merchants can easlisy transfer entities to this promising shopping cart, or from it, to more than 60 other solutions. AmeriCommerce is a hosted cart that is known and spread mainly in USA. It offers advanced possibilities for e-merchants, being used by 5,000+ e-stores overall. This e-Commerce solution possesses responsive admin templates and highly customizable theme engine, making each website a joyful experience on any device. Moreover, it suggests a number of sophisticated marketing tools, targeted to increase store traffic and conversion rate. Keeping in mind those who would like to make a switch, Cart2Cart has just established a support of AmeriCommerce migrations. Henceforward, every shop owner can transfer all his data to AmeriCommerce, or from this cart to other popular and beneficial platforms with the help of Cart2Cart migration service. The switch doesn’t require any programming skills or expertise - everything is done automatically adjusting to the migration options set. Give it a try and test data transfers from or to AmeriCommerce shopping cart for free with the help of Demo Migration!